If you see the No WhoIs button in your Campaign list you should click it. rmoov will take you to the domain list and automatically select the "Show Problems" filter so that you only see the domains that need work. If a Domain in your list has a Red button labeled "No WhoIs" then that domain does not yet have the minimum contact information required for rmoov to start sending email. This happens because unfortunately some registrars present data in different formats and also some countries have laws that allow people to conceal contact information on their domain record. First, go into the domain detail screen and try using the manual “Pull Domain Info” button. This queries domain information using a different method and often will pull information for dot com, org, info and net domains that are privacy protected etc. If the manual pull doesn’t work, click the yellow alert icon next to the domain owner name in the domain detail screen. This will open the actual WhoIs record in a separate screen and if formatting is the issue, you can often locate a contact email to copy and paste into rmoov. (email contacts for .de and .cz domains can usually be found this way, but unfortunately .co.uk domains registered by individuals, and a number of other country specific tlds are hidden by law). In many cases, you will see a link to the regional registry at the top of the WhoIs record and may be able to find a contact email by running a search there. For dot com domains that have not been automatically been pulled you will often see a link which takes you directly to the GoDaddy or DomainsByProxy domain registry where you will find an email address that allows you to contact the webmaster as a third party. Click the Blue "launch" icon to go out to the site and check “contact”, “about us” or “profile” links, footer text etc for email and or contact URL information to copy and paste into rmoov. If you have Blogspot subdomains in your list, you will need to take this option to try to find contacts. If no domain contact information can be found, use the check boxes in the domain detail screen to mark them unavailable. 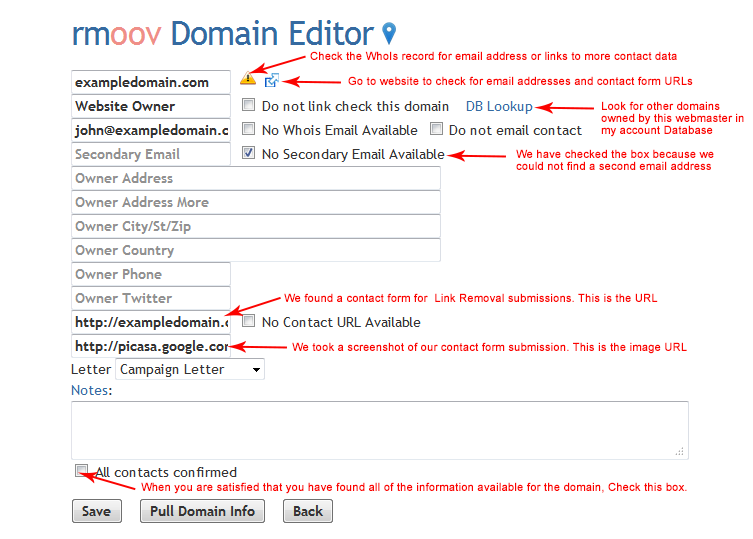 This will tell rmoov not to email the domain owner and add the URLs to the Disavow List which is auto-generated at the close of your campaign. The screenshot below provides an explanation of various domain editor functions. rmoov uses "sticky" search, so domains will disappear from the list as contact information is resolved. When the list appears empty, click Reset Search to view the complete list.